Hurricane Florence approaches the East Coast of the USA. Image by the author, produced via RadarScope software. Longtime readers of this blog know the practice here is to avoid politics and religion unless members of those institutions cross the line by bringing science into the fray. At that point the gloves come off. Listening to a few hours of conservative radio talk show coverage of Hurricane Florence yesterday on the Sirius XM Radio “Patriot” channel, climate science was discussed with all the accuracy of two auto mechanics preparing for delicate brain surgery on a newborn infant. I feel compelled to respond. Wilkow confused rotation with orbit, but I’ll cut him some slack. Rotation occurs in place (think of a spinning top that doesn’t travel), which doesn’t alter our distance from the sun. He’s clearly talking about our orbit, so that’s what we’ll concentrate on. Out of kindness, I can say that this is by far the least of his mistakes. The Earth does indeed orbit the sun in an elliptical, not circular, orbit. Unfortunately, that’s the only thing Wilkow got right. The implication that our distance from the sun affects our weather, our climate, and, risibly, our tides, is so wrong a that fifth grader could debunk it. Not having a fifth grader on hand, I’ll do it myself, and start with the low hanging fruit: tides. The Moon is responsible for our tides.2 As it orbits the planet, its gravitational tug on our home–and its oceans–causes a bulge that results in tides. Remember being taught this in grade school? Apparently Andrew Wilkow doesn’t. But the most scientifically inaccurate claim in Wilkow’s polemic is that the distance of our planet from the sun has anything to do with weather and climate. In fact, the separation of Earth and our host star has nothing at all to do with climate, weather, or even our seasons. For starters, the seasons are caused by the Earth being tilted 23½ degrees on its axis with respect to the plane in which it orbits the Sun. During the Northern Hemisphere winter, it’s colder because that part of the planet is tilted away from the Sun, receiving less direct sunlight. A fun science fact is that during this time of year, the Earth is actually closer to the Sun than in the northern summer. Yes, we’re closer to the Sun in January than in June. Distance doesn’t matter. Conversely, it’s summer in the Southern Hemisphere in January because that part of the planet is tilted more directly toward the Sun, receiving more direct sunlight. 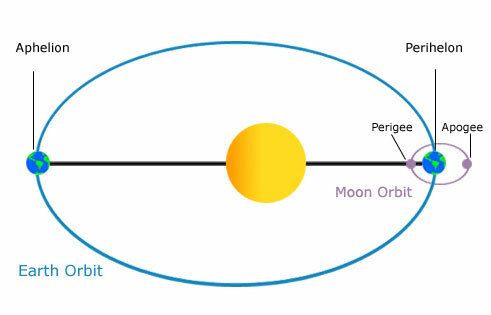 In Phil Plait’s excellent book, Bad Astronomy,5 Mr. Plait points out that very simple math shows that our non-circular orbit counts for at most a 7°F (4°C) difference, summer or winter. That’s right: statistically, the elliptical shape of our orbit contributes nothing to weather or climate change. Every year, we swing through a cycle where distance contributes no more than 7°F (4°C), plus or minus, and, a reminder to Mr. Wilkow… we’re talking weather, not climate. This is a perfect segue into Andrew Wilkow’s cringe-worthy statement, “weather patterns are cyclical.” As all who paid attention in science class know, weather isn’t climate.3 Weather concerns itself with immediate, short-term conditions; climate is the measure and average of weather over long periods of time. For an example of someone who doesn’t understand the difference between weather and climate, look no further than a senator who brings a snowball (a weather event) to the floor of the senate to “prove” climate change doesn’t exist.4 Ach du lieber gott in himmel. Full disclosure: there are some possible considerations due to a phenomenon called precession (the Earth’s wobble on its axis), our orbit of the Sun, and the fact that the tilt of our axis will cause seasons in the hemispheres to eventually reverse. But this happens on scales of tens of thousands of years. You could start making climate change arguments for Sarasota and Sydney if you stuck around for 20,000 years, but that’s outside Wilkow’s bailiwick and lifespan. 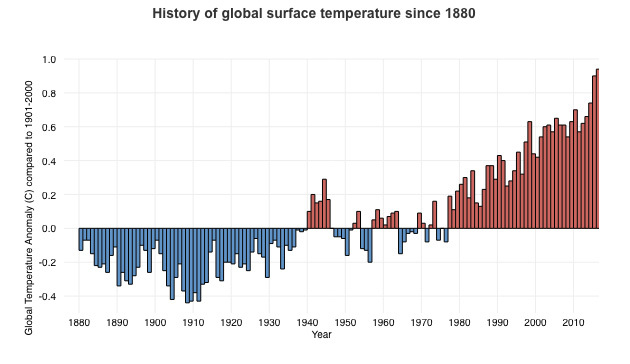 There you have it graphically: climate change is a long-term affair. After listening to conservative talk radio for several hours on Wednesday, I hope that the love affair with scientific illiteracy, as demonstrated by Andrew Wilkow and those calling into his show, doesn’t also prove to be a long term affair. The planet just can’t afford it. Authors note (16 Sep 2018): this article originally reversed units of temperature regarding the earth-sun distance effect. The correct values are 4 degrees Celsius (7 degrees Fahrenheit). Thanks to astute readers for pointing out the error. (3) NASA: What’s the Difference Between Weather and Climate? Disclaimer: I am not an Amazon affiliate marketer. I receive no proceeds from the sales of Amazon products and have no association with the author of the linked book. Hurricane Florence cover image ©2018 Mark Alsip, all rights reserved. Produced with the RadarScope app. 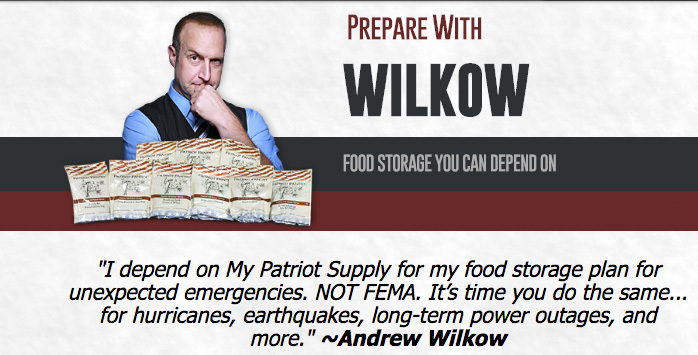 Andrew Wilkow image may be subject to copyright. Used here in strict accordance with provisions of Title 17 U.S.C. Section 107 of United States copyright law (commonly known as “fair use law”). This material is distributed without profit with the intent to provide commentary, review, education, parody, and increase public health knowledge. Earth/Sun orbit image courtesy NASA/NOAA. Used with kind permission and under provisions that image is in public domain because it was produced by a government agency. NOAA climate change courtesy NASA/NOOA. Used with kind permission and under provisions that image is in public domain because it was produced by a government agency.